While styrofoam may be most commonly associated with disposable coffee cups, meat trays and packaging, prefab home manufacturer Japan Dome House Co., Ltd. uses it to construct easy-to-assemble modular kit homes. Dubbed the "habitat for the 21st century," the Dome House is an igloo-shaped structure built from snap-together wall sections made of 100% expanded polystyrene foam (styrofoam). It might seem like an odd choice of material for a house, but the company lists a number of advantages that styrofoam has over traditional materials. Unlike wood and metal structures, for example, the styrofoam Dome House does not rust, rot or attract termites. It is also highly resistant to earthquakes and typhoons. In addition, the walls, which are treated with a flame retardant, emit no toxic fumes in a fire. The styrofoam used in the Dome House's 175-millimeter (7 in) thick walls is significantly denser and stronger than ordinary packing foam. The material has excellent thermal insulation properties, resulting in higher energy efficiency and lower heating and cooling costs. Measuring 7.7 meters (25 ft) wide and 3.85 meters (13 ft) tall, the basic Dome House has a floor space of 44.2 square meters (475 sq ft). It is possible to construct larger, elongated domes by adding more pieces, and joint units allow multiple domes to be connected into a single structure. Dome Houses, which are approved by Japan's Land and Transport Ministry, can be erected anywhere in Japan with the proper permit. According to the manufacturer, the versatile structures are suitable for use as hotel rooms, restaurants, freezer rooms, or even as hog farms. 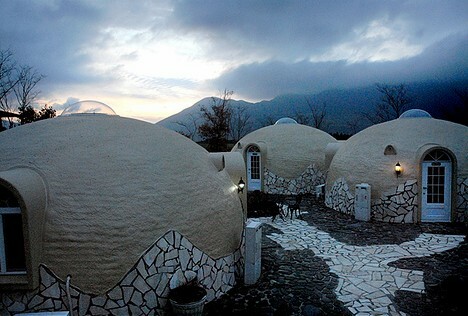 The Aso Farm Land resort village in Kyushu uses about 480 styrofoam domes as lodging, recreational facilities and retail shops. 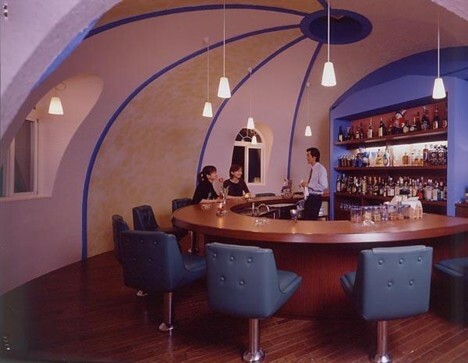 The Dome House can also be used as a bar, karaoke room, steam room, and more. Whether or not this type of home is truly "perfect for the modern age" as the company suggests, the price is right. Dome House kits start at around 3 million yen (under $30,000), which does not include the cost of transport, assembly, interior construction, etc. And to break in, all you need to a big bottle of acteone to melt a hole in the wall. Maybe Roger Hunt is from another country and speaks and writes English the best way he can, like me thow I am French speaking....do you not find this idea japanease idea nice instead of humiliating someone who come with positive mind and respect. This concept is amazing. Once everyone gets used to the idea that climate change is the new norm and begins to look for homes that are safe to live in that cost very little to heat and cool we will finally be on the road to survival. Stop the side battles, the time for fighting one another is over we have to work together. I find this concept to be earth friendly and would to have a couple of them attached. I love the idea of having energy saving alternative living options. Rodger dodge .. the acetone queen,did not allow much between h&hell when friends of mine would make home in the green zone;press the button man and send me detail about how to purchase one or . so. You make a person have strength and faith/Make my day looking at you kid. It's amazing how so many people can't even type one sentence and get it right. It's amazing how many people notice the smallest things about other people!!!!!!!!! I'm more than certain that these people designed the material so that it is not so easy to destroy or penetrate. I'm sure they aren't that obtuse, as you're assuming. Breaking a window with a hammer would be about a hundred times faster. and all you need to break into a house is a rock because of windows. so i am not really seeing your point. No ! ! ! melt down decided all about it and praise your all going in the right direction. Little boys all rushing to show how destructive they can be, and totally miss the important information. "Once the shell is put together, "coats of mortar" and paint are applied for further protection ." Now go put all your chemicals and rocks away. Start reading before you make fools of yourselves. It's not quite right to call it a styrofoam house - it's made of "expanded polystyrene," the difference being that they didn't blow as many bubbles in it, so it's stronger and heavier than styrofoam. But they make no mention of what happens if a kid throws a rock at these houses. Kids in Japaan don't throw rocks at houses - get real ! Hey hey, Hey! Wait a sec there tubby. Are you being racist?? Every little boy has a right to chuck a rock. Even if they are Japanese!! And anyways which kid would be able to resist not to take down a stupid house made of foam. I would love to hear your reply TUBBY! Yet... Japanese still don't throw rocks at the houses, no matter kids or adults, they were actually raised and "brought up", nothing an average american would understand. I actually spent my 20 years of my life in Brooklyn NY and you know what?! concrete, many door locks and security systems DO NOT STOP A THIEF FROM GETTIN IN! ... and many of them are kids!!! so....even if the perfect construction material can be used that's cheaper, more natural disaster resistant and eco-friendly, it's rejected because people behave like barbarians and kids are unmannered? i think it's easier to improve social behaviors than to stop a typhoon, in most cases. On outer shell of Duracrete stucco, and rocks aren't an issue. how to get in touch with ? Anyone over here (US) doing this? Very interested in your system. When will you go to Haiti? Are you doing any developments in Florida? Anywhere Else? 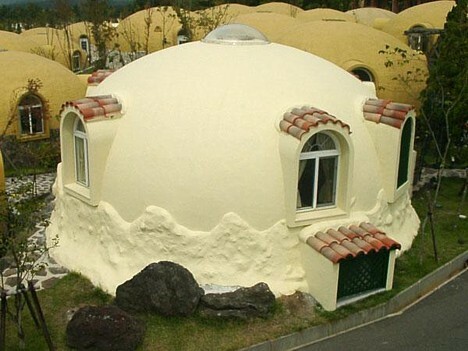 Very interested in these Syrofoam dome homes. Have you already left for Haiti? We a working on a volunteer infrastructure in PAP. Would like to see the video could you email it to me pls..
Hi so I'm doing a project for my carpentry class and I was wondering if you would be able to send me a link to the video as well it would give me a heads up on the project :) and if you also have a copy of the blue prints because i can not seem to find any. Hi nathan, I am also interested in the styrofoam homes, can you send me information on it as well. Hello Nathan or anyone I'm interested in getting any information about yours or anyone's Styrofoam housing that you might have and your video. Also interested in any information you have regarding helping out in Haiti, what's going on and who is in charge. Does anyone know how they get the plaster to stick to the Styrofoam? I would love more info on the EPS buildings you manufacture. Would these dome house work in extremely cold weather? We are looking to build a retirement home in Alaska. Would love the video if at all possible. hola estoy super interesado en esas casas me podias informar como se compran donde si hay algun sitio en españa? Can you send me the video aswell. i am interested in building on out in haiti. We are retired, in our 50's, very capable of building ourselves, and if we can find a practical, easy to handle, way to make our dream home/Ranch come true.. We hope even to have land enough to make a compound of sorts for our friends and family to get involved too..
Hi, i'm moving to NZ and would like to knnow how to go about buying something like this. Also what are the costs involved, if you can please send me some info I'd grately appreciate it. Missus and I are thinking about building a dome retirement home, does anybody supply kits or build the domes shown in your Video, here in the USA.. also can you give us an idea o0f costs involved? Nathan, send me same video. We are a company seeking new technology and eco friendly construction. Developing mini-units for the new urbanites! Let's discuss the future not our past ! release the petty discussions! I am trying to find where to buy the pre-fabbed shells or a machine that will make them?? Can anyone help me? Were you ever able to build this house in the U.S. and what kind of difficulties did you experience getting a building permit. What did you use on the interior for a wall covering and are you able to hang pictures on the walls? Did the kit also include the foundation? Did you ever get an answer? American ingenuity domes are made in Florida. The structure goes up in a similar fashion but the panels are 3/4" concrete, steel mesh, then 7 inches of foam. No little kids rock is gonna damage the finished product. I want one !!!! How can I get one ? What is the cost? aesthetically they are amazing and beautiful, but i can't say i wouldn't be worried about their integrity. i'm a nervous nellie when it comes to my nest. $30,000 before finishing for that sized space is overly pricey. I can be wierd for free. I would be less worried about their integrity than about their appearance which is niche, to be kind. The design looks like that unless the material itself falls apart after exposure to UV rays or extreme temperatures, it has greater integrity than a convential house. A picture of one of these with an igloo doghouse outside of it would be funny. there have been house's made in the same way in the uk about 5 years ago with the styrofoam sandwiched between two sheet's of ply. you can make whole 5 meter long walls of the stuff that are put up in minutes. EPS is the company name. $28,000 for 3 bedroom 1400 sq. foot house with garage. plus $20k to build it I suppose. Cats will love to scratch their claws on these things. We've had the same type of Domes here in Davis California since 1972. 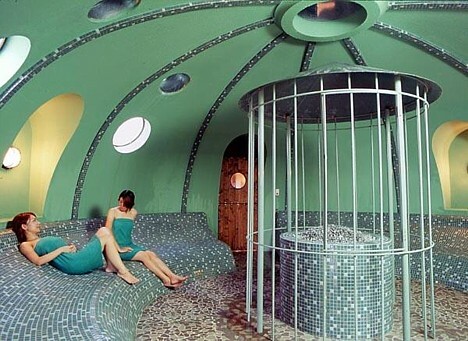 They're kind of cool, but 40 years of people living in them, modifying them without showering has made them smell bad. I would like to see more stuff like this. They clearly last. Wow! This is an awesome example of modern architecture ^ ^. It indeed seems perfect to me. I mean the price is that of an average car, right? The assembly takes a very short time, and they can be connected to! I probably wouldn't buy one, but housing shortages could use 'em. And it might only take a few hours to put up the styrofoam shell, but you still have to furnish. All that woodwork and stuff in the third picture probably took more than a few hours total. A bottle of acetone will not put a hole in the walls because they coat both sides with plaster or concrete after they are assembled. Your's is the only comment that makes sense and is not flippant. ESP (Expanded polystyrene foam (styrofoam). also can be reinforced with wire mesh, rendered on the exterior with a cement gravel mixture and painted with various polymer resin paints. How secure is that? Forget about kids throwing rocks at it or some twisted mind thinking to pour acetone on a ESP dome house. Seems like a cooler idea to make a buckminster fuller inspired geodome made from your own Structural Insulated Panels... just order them from a nearby factory (there's one in Tenn that delivers to the east coast - I built a SIP roof on a rowhouse in DC from them)... and cut them into equal sized shapes and assemble your own dome... shitload cheaper than 30K, but probably requires your own CAD expertise or at least an understanding of how to draft/use graph paper & measure well... it's pretty easy to work with SIP's (foam expanded between pieces of plywood under pressure). If you would be so kind, I would love to find out more about this company in Tennesee. I agree that 30k is alot of money for this product, even though I believe it to be a superior way to build a house. Thanks in advance to any info you could supply. Modern research in neurophysiology has shown that the brain works differently according to the direction you face. Reminds me of a Kevin Heavey sculpture. Here in the US, we had something similar as attractions. They were quickly outdated because technology advanced leaps and bounds faster than the technology featured in the house. And most people (back then) could never accept dwelling in something so unusual. Oh and if someone did throw stones, I doubt there would be much damage. It's "concrete" covered "foam". And this place in Florida survived a few hurricanes, before they finally demolished the abandoned structure. Also if pipes and electrical and other future conduit type systems were under a removeable ,yet atractive cover recessed in the wall then plumbers and electrician and future skilled craftsmen could access those systems (or even a home owner who has time) for repair or modification retrofitting. ALL I HAVE TO SAY.... ((FOAMCO)) IN SAN DIEGO,CA!!!! THEY WILL WORK WITH YOU UNTILL THE SKY TURN DARK AND RETURN HOURS BEFORE SUNRISE, ONLY TO ENSURE 100% SATISFACTION!!!! These domes can be coated with GigaCrete Inc's StuccoMax (outside) and PlasterMax (inside). These coating materials are far superior in every respect to traditional stucco or plaster, respectively. StuccoMax and PlasterMax coatings are LEED certified (green, safe, non-toxic, no VOC) ), UBC (uniform building code) fire rated, directly appliable to any surface including styrofoam, contain no Portland cement, are immensely strong (compressive strength over 10,000 psi), are abrasion and scratch resistant, will not shrink or crack, easily painted or pigmented. I can't see any website link? I would love to get information. I live in Sweden, is there any company selling this kind of domes in the north of EU? Instead of searching for trivial drawbacks, I think these houses are brilliant. They are MUCH more affordable than ordinary housing, and are extremely energy-efficient, which would make them very affordable to heat or cool. Placed over a basement, there would be plenty of room for anyone to live comforably. They would make great starter homes for couples starting out on a budget, or the elderly living on fixed incomes. I think there is a huge potential market world-wide for these homes. It's nice to see someone designing AFFORDABLE and practical homes instead of the unaffordable monstrosities you see going up in most areas (in California or Nevada, for example). I hope these homes catch on. They solve a LOT of problems. this would great for the Homless all around the world..
omg i love it! I want to buy like 3 and put them together some how! They are awesome! This may be my retirement home in 2020. What are shipping cost to US towns? Uhhh...has anyone thought of how you might install SHELVES or hang pictures on the wall? Yeah, they're cool-looking, but very impractical. And what about those 13' ceilings? Where do you think all your heat in winter will go? DUH... Who needs ceilings that high? 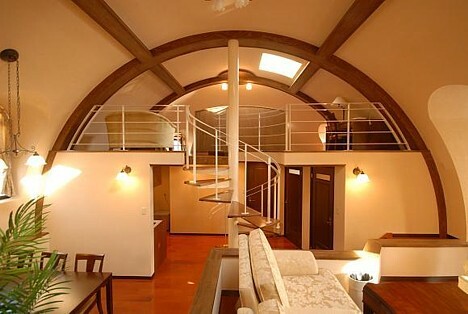 Domes actually keep things warmer than standard rectangular shaped rooms with corners. Do your research. Why do you think Eskimos build igloos in a dome shape? Furthermore, hanging pictures or shelves isn't nearly as much of a concern as inexpensive and eco-friendly housing. What could possibly be more practical than that? I don't give a crap if I couldn't hang a picture or put up a shelf. That's just decorative nonsense. These house are the EPITOME of practical. Rot. Hanging pictures and shelves is more important than "eco-friendly housing" to the average purchaser. Most people don't care much whether their house is "eco-friendly" or not; everyone cares whether they have adequate storage. Get out of your soy-latte world and into the real world. Soy Latte World? You must be a NEOCON Mental midget. A Dome has the advantage of being less expensive to build, stronger and more economical to live in and you think only the Soy Latte's will appreciate. Go jump off something will ya! It is quite good stuff for hanging onto insulated walls. For my domehouse, which I produced, see http://kulisy.cz/fotogalerie/igloo.html . Domes have 33% more volume for surface area than standard square construction. That is why a air bubble in water is that shape the water pressure pushes the air into the shape with the least surface area it can.... so 33% less surface area = 33% less thermal transmission (heat energy transfer) even with identicle insulation A dome will use 33% less energy then conventional square homes of the same volume. 13' ceilings definitely make me feel less clausterphobic. also rock in the summer. I think u could make some very cool shelves with the ends embedded in the walls like a chord across a circle. I'm sure masonry anchors will work to hang pictures. "In addition, the walls, which are treated with a flame retardant, emit no toxic fumes in a fire." I don't buy that, in my jow we work with these materials and flame retardant means that it takes more time to ignite, but as many other petroleum based materials the fumes are definitively toxic. where can you buy these? Dome houses are treated and covered with cement on the outside and plaster on the inside... Which solves the problem of "kids throwing rocks� and someone damaging the inner walls with acetate. The topic "Styrofoam Dome Homes" is a blatant misnomer. These dome houses are NOT made of Styrofoam! They are made of special Expanded Polystyrene (EPS). 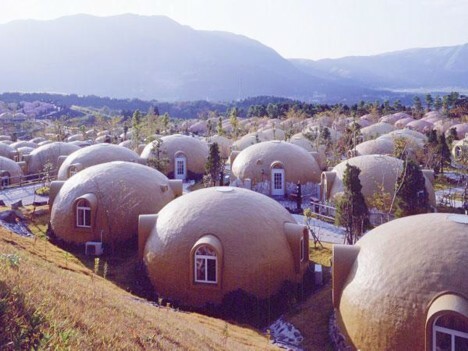 The EPS used by Japanese dome builders (who must comply with the world's strictest building material and construction codes) contains an anti-oxidant to resist aging and emits NO formaldeyhde. As to fire concerns, EPS will melt before it burns. As mentioned, the application of GigaCrete Inc's fire-rated, LEED ("green") certified exterior coating 'StuccoMax' and interior coating 'PlasterMax' renders the EPS structure entirely fireproof. Both coatings can attain compressive strengths well in excess of 10,000 pounds per square inch and will neither shrink nor crack. StuccoMax and PlasterMax are light immensely strong coatings that contain no Portland cement or any toxic substances. Their surfaces can be painted or, better yet, the pigment can be added to the mix before application. Whereas Portland-based stucco requires two or three coats, both StuccoMax and PlasterMax are one-coat products, either troweled or sprayed on. They stick to virtually anything including drywall. I've been looking at building a dome house in the USA . I can build the house of my dreams for half the cost , radiant floor heating & solar panels ,go completely off grid ! Cooler still , YURTS!!! you can put up a 30' foot yurt (900 sq feet ) for less than $10K , throw in a bathroom & a kitchen for a total of $20K . There's no need for homelessness . The gov't could set aside some of the more than 50% of our nation's land they have , & volunteer organizations could build communities of them . I do wish I could get the styrofoaam material here , but larger than the ones they were building . I've got 6 kids . I need more than a 400 & something sq. ft. house. It's not that difficult to give up traditional structuring. We only have the illusion of security in our dry wall built structures now . At present our homes are largely made out of chalk! You could have the largest lock on your front door , but if someone REALLY wanted to , they could put their fist through your wall & tear their way in . They would have a hard time putting their fist through a half inch sheet of plywood. That's what's under the siding on the outside, although these days it's usually oscillated strand board. i think its a smart way to build a house. I would like to purches a styrofoam dome home. How do i get started? Buckminster Fuller would be proud. In a matter of moments after showing this post to friends, a plan was hatched to move here if McCain wins. Thank you! Domes are wonderful structures to live in! We build our own 7 dome structure as our returement home. The peacefulness and comfort is unbelievable. I would have some concerns of strength with just foam. Our domes are schulptured concrete structures with the foam on the outside for its insulating qualities. With the concrete on the inside we have the thermal mass that keeps the temperature pretty constant all the time. We love it! Several people have made comments about the structural integrity of these domes, even though the article clearly states they are assembled and then coated with a protective layer of mortar and then paint. I'm pretty sure under those circumstances, it could do pretty well against an earthquake, hurricane AND a "kid throwing a rock". After Hurricane Katrina, some of the only houses left standing in affected areas were polystyrene dome houses. how doi go about finding someone in florida that builds these. Help want one. How about Southern Indiana? What is the closest location where I could purchase foam material (dome home)? @hollie: Send them an inquiry. do they sell them in Europe - Spain? Are plastic houses an ecological solution? would be generated if they do catch fire? I have been designing, manufacturing and exporting timber framed dome kits for many years and never had a request for an all plastic design. Most of the buildings you see anywhere that are stucco and have fancy architectural articulation i.e. columns, cornices etc. are made of the same material and coated with stucco. No problems. This isn't all that radical and should be further explored. 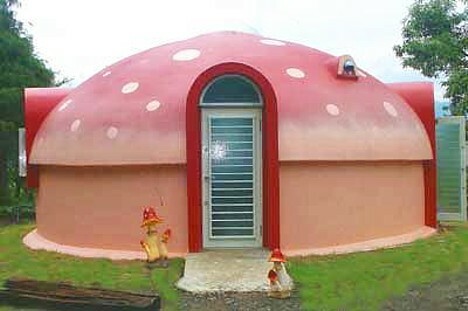 I AM THINKING OF BUYING ONE OF THESE FOAM DOME HOUSES FOR MY LAND IN THE CAYMAN ISLANDS,BUT REALY POEPLE THE IMFO ABOUT THESE HOUSES IS CLEAR,GOOD INVESTMENT AND VERY GREEN, AND ANYTHING ELS IS A BONUS. Iam impressed with your concept of cheap housing as demonstrated by the styrofoam dome houses.I wish to offer my land for demonstration purpose.would you love to come to kenya and work here?we can work together to sell the idea.The concept fits well with the traditional house strucure. willing to offer you land in kenya for dissemination project. These Dome Homes SHOULD be used in any areas where Tornado's and Hurricane's happen. Make a few modifications, Tie them down properly, and they should come through the strongest ones to ever hit the US yet. IF ANY ONE WANTS TO HELP BUILD MY DOME HOME IN RETURN I WILL GIVE YOU A FREE HOLLIDAY ON MY ISLAND, CALL ME ON 09065501069/07960166670 IM IN THE UK. POE, MY BROTHER DIED, PURPLE BLOOD ALL OVER THE FREEWAY. I think that something like this should be made available to the victims of Haiti. Small foam houses can accomodate many displaced Haitians in a short time. For earthquake area homes I would put forward container homes that are fire and more likely brake resistant AND I ADD that can be easely beautified and adapted to local cultures with plants, ivy, wood etc..
Looks really cool. Many good properties. Unfortunately, I have some experience with foam as a home. The Farm community in Summertown Tennessee used large sheets and blocks of "Amotex", an expanded polystyrene foam product we found easily available. It was used primarily as insulation material inside of canvas-skinned basic framed structures. One structure caught fire in the night and a family was seriously burned. When it catches fire, it turns into a kind of napalm - melting and dripping and sticking to whatever it touches burning. Also witnessed a demonstration filmed where half of a normal house room was mocked up, with ceiling, and this same foam used in the walls for insulation. The camera was set up a good 10 to 12 feet from the structure, which was then set alight. The literal explosion of flame, once the foam firmly caught, was shocking to everyone who witnessed the demonstration; the camera having to be heroically snatched in the nick of time before being engulfed itself in the spew of fire. Even with "a layer of fire retardant" and a layer of stucco, there is not way I would have my family inside one of these. I have been gathering the history about the Pioneers and inventors of thin shell domes. Wallace Neff is one of the earliest users of sprayed concrete for domes that I am aware of so far. we have a great picture of Wallace Neff inflating one of the first balloon formed domes. http://www.mortarsprayer.com/thin-shell-construction/wallace-neff/ If you have any more history of Mr. Neff or other thin shell pioneers, please let me know. I live in Texas and many of us are into eco-friendly living, and energy efficient building. Not many harsh building codes to deal with presently where I live. We have an annual, what we call, "green scene" demonstration and part of it includes building and showing green homes. Many of us live completely off the grid, and go so far as to use water catchment for our water supply, and such. I would like to bring this technology to the area. I Have 5 acres of land in Texas and Would lend it out for a demonstration building of one of these Styro-Stucco Homes. If interested please contact back. Thank you. I'm interested in your comment you made, and was wondering where and how often is the expo you hold Texas and where in can stop by, and this expo for people interested in green living. that they will never be affordable, or available in the U.S.
don't OWN their own home, or it's made from cardboard in third world countries.. These things should cost about $300-500 dollars for a small 20ft round geodome!! how beautiful and nice the houses are, i like them very much. You can also have a look at the nice and warm ugg boots. We used to do this kind of construction for indoor theme parks. If you are in the US you can probably make this on your own. Try to contact a company named, Futura. They have machines and chemicals that will spray this foam on your pre-made structure. When it gets dry it will get hard, but I will not say it's unbreakable. I like dome but I may use cement instead of foam. What about the toxicity of any kind of foam? In the manufacturing, and, when this stuff is tossed out after the house needs a rebuild or someone tears it down for some reason, then what happens to the foam? I still think all natural materials is the way to go, materials that are sustainable, inexpensive and abundant such as straw, earth, bamboo, and other softwoods that can be produced quickly without a big environmental impact. Think of the big picture and not a band aid as a solution, this is what I am after. I love these houses!! I would like to know if there is any 'out-gassing' problems with them, after all, it doesn't matter how cute they are if they poison their occupants. Cool . Anyone build one yet? Am I missing something...don't see how to contact the supplier...wondering if you will send them to BC Canada and what would be the cost for a 30 foot one?? I'm also looking for possible building one of these homes in Alaska! I would like to know everything. Wow it is insane to see how many responders can make something so easy, so difficult. think of. If you are worried about integrity, then use a wood frame and beams to hold the floor of the second story or the roof. As far as being a new technology - this material is being used and has been used in most stucco sided buildings in the us. They call it outsalation. The process is like this. 1. The building is framed out using beams to cross spans and add structural integrity. 3. The stud wall, facing the exterior is covered with Sheetrock using screws as fasteners. 4. The sheetrock is then covered with foam usually 2'x3' .the fastener is cement applied in the order of the edges and the middle. 5.After the whole wall is covered. A rasp is used to smooth out the wall ,attempting to appear as being a flat surface. Mesh is rolled over the wet cement adhering to the wall. Then a trowel is used to embed the mesh into the cement, and smoothed out again using a trowel. 7. Now the plastering process is started by using another coat of cement to the exterior wall. This is usually called a brown or scratch coat. 8. After this the final step is to apply the stucco coat using what ever Finnish you desire as this is the last coat, and will be seen. those of you who are worried about strength think again. Most likely you have been in a foam structure and didn't know it.examples...mcdonalds, or and modern motel you have ever slept in. I am using this exterior finish as an example of how common foam is and we never realized it or questioned the integrity. As far as flat roofs go, just cut out notches where you want them and lay your timbers across the free span and deck it as you would normally do. Then you will have a modern adobe house. To cut the foam for electrical use , use a router or a hot knife before you cover the interior walls. For the Eco friendly people this can be a lower impact process if you choose to make it so. For the pros, know it alls an spell checkers forgive me of my shortcomings. Me enviarian mas informacion sobre estas casas, estoy muy unteresado en construir una . Would these house plans also be applied, if I wanted to build my home underground & top it with dirt? can i built this dome houses in sfrica,iam based in zimbabwe ,iam very very facinated with these dome houses ,what other material ,cheap can be used to construct these housese. I believe these Dome homes are the future of housing , after all , we've been living in Trees and Stone caves long enough , So to Speak , now we have the chance to up grade to man made materials and save our Trees and Concrete for other things !!! The reduced cost of building material should be enough to sway any of you not to mention environmental reasons !!! Wake up people , this is our world we live on !!! OH did I forget to say THANK YOU VERY MUCH for the Japan Dome Home Idea Love It !!!!! Un futur habit� de macarons en polystyr�ne - Gizmodo - Tant d'amour pour ces fabuleux nouveaux gadgets, c'est surnaturel. Styrofoam Homes could be the future! | zedomax.com - Obsessively profiling DIYs, HOW-TO,Hacks, Gadgets, Tech, Web2.0,and beyond. Styrofoam Dome Homes « It’s Here Now … Where am I? Casas Pré-fabricadas « oh mighty!